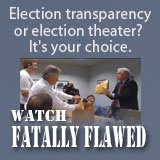 Fatally Flawed: The State of Elections in the U.S.: Chuck Huckelberry Claims RTA Investigation Was the Result of "a Conspiracy Theorist"
We can guess Pima County Administrator Chuck Huckelberry is referring to John Brakey, who caught them fiddling with another bond election last Thursday. Yesterday they locked the observation room to prevent anyone (especially Brakey) from seeing the monitor that is prominently displayed for the purpose of transparently showing to the public the electronic procedures in the tabulation room. Quite an admission of guilt considering the public service Brakey had provided last Thursday. He had informed Brad Nelson about his nine-year employee breaking a seal and inserting an ethernet cable into what was intended to be a stand-alone machine. Nelson was obligated to call the more docile, innocuous elections observers back so they can redo the Logic and Accuracy Test. He should be grateful because that is consistent with his excuse that the breach was an accident. Of course, he isn't grateful because it was obviously no accident. This responds to a recent letter to the editor asking whether Supervisor Ally Miller is correct that there was never any verification of the 2006 Regional Transportation Authority (RTA) election. 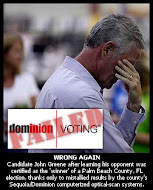 Supervisor Miller is incorrect. A conspiracy theorist suggested the county flipped the 2006 RTA election. After an investigation by the Arizona attorney general, who hand-counted every ballot cast for that election, the results were the same. A complete hand count of every ballot by the Arizona attorney general is the best verification that these election results were correctly reported. To suggest otherwise is simply political grandstanding with the intent to deceive and mislead voters. Huckelberry: If it was a "conspiracy theorist" that caught your Elections Division rigging the RTA election, why would you then spend millions of taxpayers' dollars after Goddard's recount to prevent a simple forensic exam of the ballots? Goddard alleged in his press conference that they did such a good job, they found 63 additional ballots. Evidently, this was supposed to distract the public from the fact their count was missing four precincts' worth of ballots. Goddard's investigation was so bad it garnered national attention on the Mike Malloy show once it was discovered that over a third of the poll tapes (that Goddard refused to inspect) were missing. From the perspective of a statistical analysis, one only has to consider the odds for the same precincts experiencing the same re-upload errors correlating to the same missing poll tapes. Attorney General Terry Goddard clearly moved beyond what is considered 'executive discretion' and served in some capacity to ensure Pima County's right to commit election fraud. Time for Huckelberry to step down. Wow, you nail him. What a what a great job stating the facts.